Update: We've freshened up our review of the Japanese unit to reflect the new stuff that we've experienced with our new American unit -- mostly through firmware updates. Wherever you see the bold, red word "Update" you'll find new info. And while you're in the mood to read PlayStation Vita impressions, you can see a different perspective on the hardware in Engadget's review. Sony's PlayStation Vita packs an enormous 5-inch, 960x544 screen, a console-like dual analog interface, and 3G/wi-fi functionality, combined with a widespread program of digital distribution through which every Vita game will be sold on the PlayStation Store. With advanced online features, incredible graphical performance, and that screen, the Vita provides the most console-like experience of any handheld, while also taking advantage of the handheld format with input methods like touch-screen and (direct) tilt controls. In a way, it's coming at the Wii U from the other direction. A quick disclaimer: I'm not going to be able to answer the issue of whether dedicated handheld systems can continue living in the age of smartphones. I am of the opinion that there will always be room for things like the 3DS and PlayStation Vita, but that's a larger issue, one external to the evaluation of the Vita as a device. I'm also unable to guess as to its chances against the 3DS, which has a year headstart, a price advantage of around $100, and two popular Mario games; the Vita is technologically superior and loaded with features, but, then, so was the PSP compared to the DS. Besides, it's too late to address the necessity of the Vita: the device has already been designed and produced. My goal is to talk about the merits of the existing device, rather than discuss the merits of dedicated portable systems as a whole. 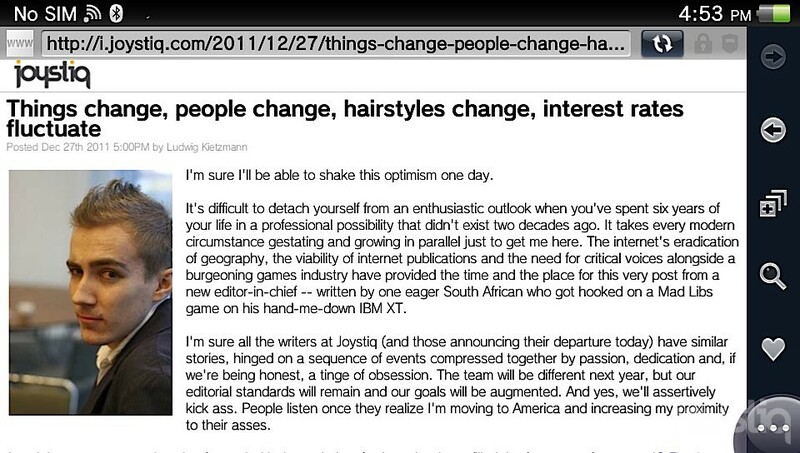 And, as it turns out, this thing has plenty of merits to discuss ... and a few obvious issues. Despite my hesitance to address the issue of competing with phones, Sony clearly paid attention to the devices. The Vita takes some design cues from the iPhone 4, mixed with the PSP. The front is a single piece of plastic, much like the "Gorilla Glass" iPhone front in appearance, with extra textured plastic sticking out surrounding the D-pad, buttons, and analog sticks. The back features two small divots for "grip" and a smooth plastic surface for the rear touch pad (more on that thing in a bit). Surrounding the device is an extremely glossy metallic rim, which is either plastic or metal coated with plastic. The top of this rim bears small circular power and volume buttons. With all that glossy plastic, two surfaces designed to be touched and swiped, and the "crystal black" color, I don't suggest keeping one of these around if you're a fugitive from the law. It'll be completely covered in fingerprints the first time you remove it from the package. Though the Vita, being self-contained, is easier to carry with you than, say, a PS3 or a tuba, it stretches the definition of "portable system." The PlayStation Vita is big, in other words. 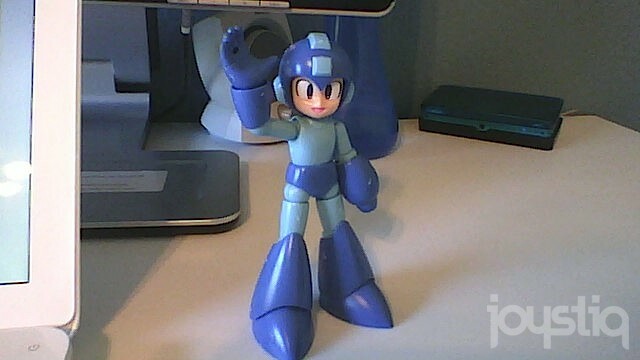 So big that my tiny thumbs find difficulty reaching the middle keys of the on-screen keyboard. The device has to be wide to support the 5" screen, but that width also makes it impossible to even consider carrying the device in a pocket. The two tiny analog sticks jut out from the front, cementing the notion that Sony is fully aware this isn't for pockets. The device is big for two reasons: first, it's loaded with technology, able to produce visuals that get pretty close to HD-quality, far more impressive technically than anything I've seen on a handheld. Second, the size makes room for a generous 5" AMOLED screen, which is almost panoramic in person. It is very big, and very bright, with clear views from any angle. It's lit brightly enough that I was able to play Uncharted: Golden Abyss reasonably well in full sunlight. I had to squint in some areas, but it works better in sunlight than any other backlit system I've tried. The Vita features almost the full suite of buttons found on a Dual Shock, including four face buttons, start, select, and two shoulder buttons, along with Sony's instantly recognizable segmented d-pad and two of the cutest little analog sticks you've ever seen. The new sticks are true analog sticks, rather than "nubs" like the PSP. They don't double as buttons like those on the Dual Shock, and they're also much smaller than their console contemporaries. The surface is rubberized for grip, and overall I have no complaints about them. I can move and aim just fine. I thought I would have more issue with the buttons, as they are also diminutive and huddled close together -- even compared to the PSP -- but I had no issues there either. I will warn you that my hands are very small. The back of the system is occupied by the rear touchpad. It seems like it would be difficult to hold the system and operate this interface, but it's comfortable to hold the device with the palms of both hands against the sides, freeing the fingers to move. I have yet to be convinced of its necessity by any of the games I played, but it is usable. It didn't seem very sensitive -- though a Welcome Park minigame purports to require different amounts of pressure, the response seemed perfectly digital (i.e. on/off) to me. Update: Since the arrival of firmware version 1.6, the light on the PS button glows blue whenever the system is on. All the time. When it's in standby, it glows orange. The battery seems to be on par with the 3DS, meaning that terrible battery life in handhelds is officially a Trend. In a real-world test -- a bunch of Uncharted on a car trip at maximum brightness (which is lower than the system's maximum brightness, a restriction I don't understand) -- the battery lasted four hours and 28 minutes. This was without any network features on, and mostly without sound. Wi-fi or 3G would only increase the drain on the Vita's battery. For charging, the system comes packed with a USB cable and an AC adapter. The cable used to connect the PSP to the AC adapter is actually the USB adapter as well -- you just unplug it from the AC adapter to get to the USB connector. This is a smart piece of design that prevents you from having to carry two separate cables around, and makes the too-frequent act of recharging at least more convenient. The device charges over USB, but only when powered off. You can charge over AC at any time. In a real-world test -- a bunch of Uncharted on a car trip -- the battery lasted four hours and 28 minutes. The "XMB" interface seen on the PSP and PS3 is completely gone here, in favor of pages of big, circular icons, navigable only via touch. With just ten huge icons on each "page," it feels like there's a lot of space being wasted here, but it is functional. You can change the background of each page, rearrange icons, and otherwise customize by holding one of the icons for a few seconds. Clicking any icon brings up that app's "LiveArea," an interstitial page with extra information including a link to the app or game's official website, the PlayStation Store for DLC if applicable, and an activity log of what you and your friends have done related to that app. Tapping the PS button will allow you to browse all the "LiveAreas" of apps you have open in a Cover Flow-like configuration, and a series of icons at the top of the screen shows you everything that is running simultaneously. To close an app, you "peel" the LiveArea off the screen from the upper right corner. Overall, the interface feels like a tweaked, funhouse-mirror iPhone, just slightly different from what I'm used to from iOS. But once you get used to that dissonance, the new OS is powerful and usable. You can pause a game by tapping the PS button and navigate the menu, perhaps to check Twitter or Near or some other networking app, and you can get right back to your game in the state you left it. You can also conduct background downloads while doing other stuff, which is neat. 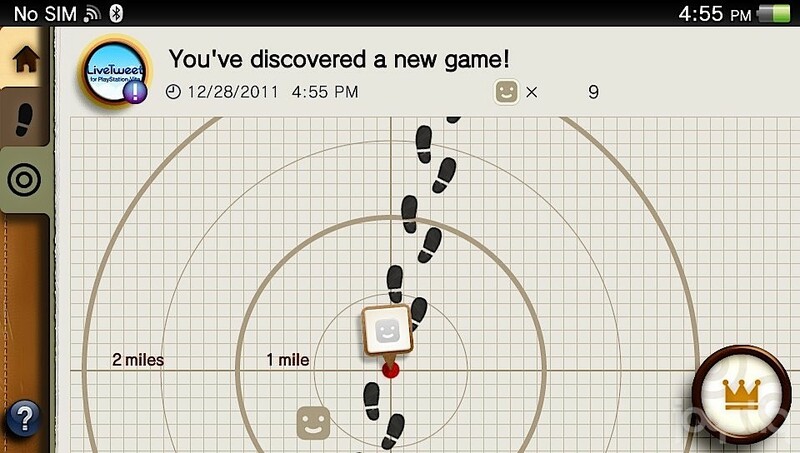 One warning, however: both Uncharted and the Gravity Daze demo disabled network features while running. Perhaps they're too processor-intensive? For such a cool feature, this seems like a big problem: "you're always connected except when you aren't!" Update: We didn't have any game cards with our Japanese unit, so I'm only now experiencing a retail game rather than PSN. There's something odd about them: when you put a card in the system for the first time, you wait a few seconds for it to "install," at which point an icon is placed permanently on your menu. Without the game in the system, all you can do with these icons is open their LiveAreas, to find links to DLC and official websites. Try to run the game or open the manual and you'll be told to insert the card. You can snap screenshots by pressing PS and Start together, which is really useful if, say, you're writing a review of the Vita or a Vita game. With the downloadable LiveTweet app, you can even tweet those screens directly. I love this. What I don't love is that this is occasionally disabled as well, as I discovered when playing a PSP title. Transferring data from the Vita is limited, by design. If you use a PC, you must install the Content Manager Assistant program, and then move stuff around from within the Vita's "Content Manager" app. That in itself isn't annoying -- it's simply more limited than being able to move stuff around on your computer like the Vita was a drive. The restriction is no doubt to prevent people from copying game files for potential piracy, and to prevent them from loading unauthorized software. I'd also speculate that to be the reason for the new, proprietary, and painfully expensive memory card format. If you have a PS3, it's the same -- all the work is done from the Vita menu. Update: On February 8, Sony released a Mac version of the Content Manager Assistant. It works identically to the PC and PS3 versions, simply allowing the computer to interface with the Vita. The actual management is still done within the Vita. Because they look really bad. Incongruous with the clean design of the unit and the bright, sharp displays, pictures taken with the Vita are muddy, washed out, and lots of other adjectives relating to water. Depending on the light, the 640x360 Vita cameras perform slightly better to slightly worse than the 3DS's cameras, or at least poorly enough to merit a comparison to the 3DS's cameras. This is clearly for gameplay use only, and not for any actual picture taking. Update: A new firmware update has enabled video recording from the Vita's Camera app. A simple toggle button switches from photo and video mode, and an on-screen button initiates recording. It's quite easy to use and you can record video with either the front or rear camera. 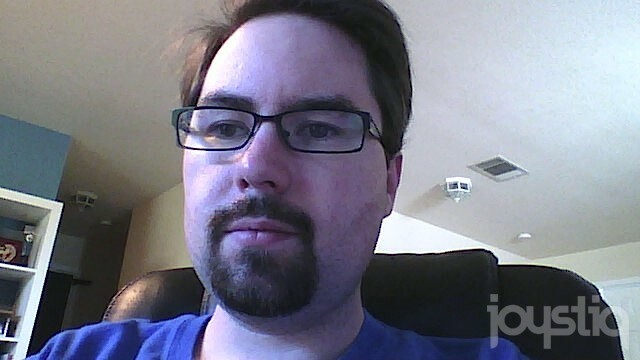 Of course, the Vita cameras aren't any better in motion. You can connect to the Vita's version of the PlayStation Store direct from the menu, or from within the LiveAreas of many games. 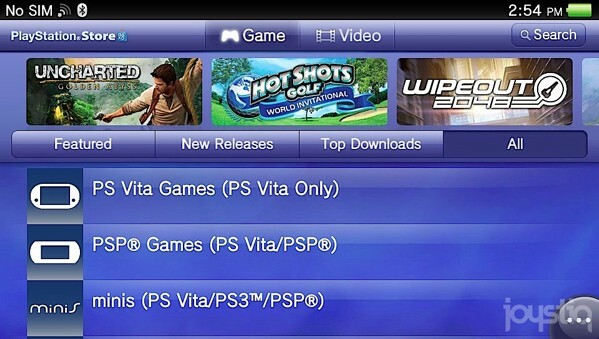 There, you can find content divided by platform and type -- Vita games and applications are separated, as are PSP games. Browsing Vita content is painless enough, with several marquees at the top advertising new and popular content, and menus leading you to games, DLC, demos, and trailers. Rather than filling a cart, content begins downloading immediately in the background when you buy. PSP games are significantly less pleasant to browse. 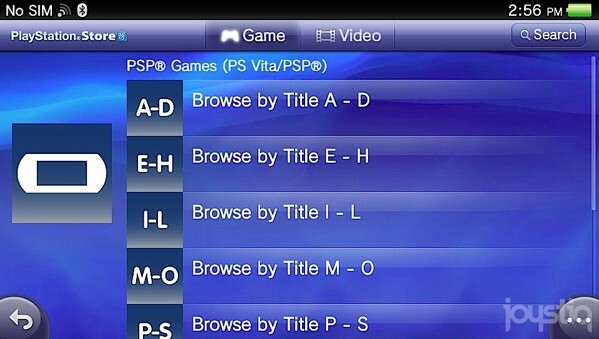 You can choose to browse the list of available PSP games either alphabetically or by category; that's it. Just choose how you want to look through lists. Furthermore, all PSP demos appear to have been excluded from the Vita's version of the store, forcing me to resort to the paid Dissidia Duodecim Prologus demo, and forcing me to remember that there's something called Dissidia Duodecim Prologus. That Prologus purchase was done in the interest of testing the Vita's PSP backwards compatibility. PSP games run on the full (giant) screen, which does make them look rather jaggy in comparison to Vita games. A super secret menu is available to allow you to enable bilinear filtering, which smooths the look quite a bit. Through that menu (hold the touchscreen for a few seconds), you can also choose which of the Vita's cameras to use with the rare camera-enabled PSP game, you can choose to limit display to the PSP color space, and -- most importantly -- you can set the right analog stick to emulate either the d-pad, left stick, or face buttons. PlayStation 1 games still don't work on the Vita, and thus are filtered from the store. However, PC Engine (Turbografx-16) games are available in their own section of the store, and they appear to run exactly like PSP games, in PSP resolution, with the same filtering and analog options. 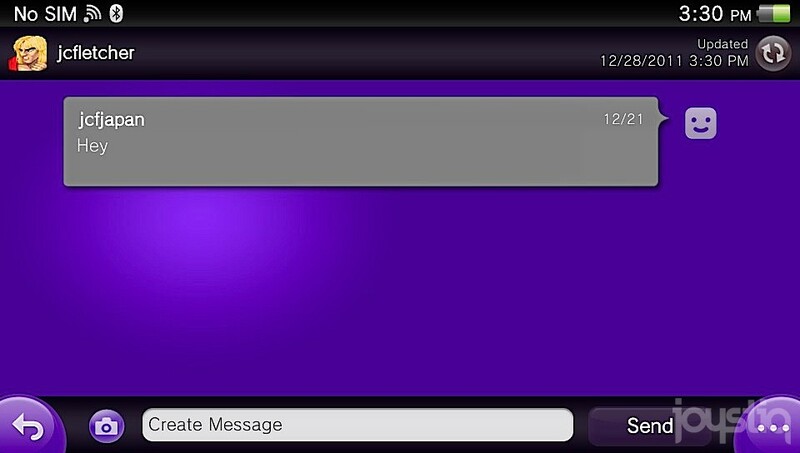 This brings up a major issue with the system: the single PSN account. I encountered this issue within the first 15 minutes of using the Vita. I associated the system with my North American PSN account to test its PSN functionality, and there was no store to connect to, rendering me unable to purchase or play anything. Update: The PS Vita's PSP backward compatibility is not as comprehensive as initially believed. The list of compatible games sits at 275, as those are the only ones available for download from the PlayStation Store right now. Even if you transfer an unlisted game through the PS3, it won't work on Vita right now. In order to familiarize new users with the multifarious control schemes, the Vita includes an app called "Welcome Park" consisting of a series of minigames. I've covered these elsewhere in more detail, but suffice it to say they're both amusing and unnecessary -- since the controls are designed to be intuitive in the first place. Most importantly: you can get Trophies from the minigames. The Vita is designed to communicate easily with others -- that's what the 3G version is all about, since you can't use that connection to buy games. To that end, a separate app exists on the menu to manage PSN friends -- to view their Trophies, play history, send new requests, and block users. Another app allows you to send photo or text messages to your friends, though I don't know why that's separated. Yet another app is used for party chat while playing games. Even though Trophies show up in the Friends app, there's also a dedicated app for viewing your own trophies. There is also a web browser. It's functional. You can browse websites on it, which show up in their mobile versions much like a smartphone browser. You can't watch Flash or HTML5 videos in it. I am neither excited nor disappointed by the browser, as it is a browser. And then there's Near. Designed to show a map view of what people around you are up to, as well as share items, it's a clear answer to the 3DS's StreetPass. I didn't get to explore this fully for the obvious reason that nobody near me has a Vita, but I can tell you it's damned confusing. Right now it's telling me that two people nearby have played Welcome Park, but it's clearly just referring to me. It also says I'm not sharing my Online ID, although I've turned that on in the settings. I was also informed that nine people are playing games in my area, which turned out to be me having played nine games. It's confusing to navigate, and doesn't seem to be interested in giving me accurate information. 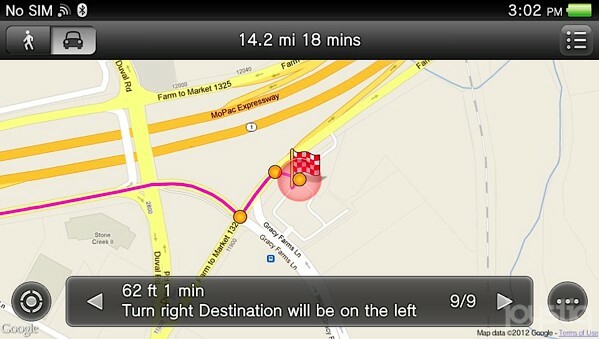 Update: The Vita now comes with a built-in Google Maps app. Those of you with Google Maps smartphone apps will recognize the interface and the functionality, allowing you to pinpoint your current location and generate directions to it. You won't be familiar with the seconds of lag every time you enter a location or even move or zoom the map. I can't imagine trying to use this to actually navigate the real world. The fact that every Vita release will be available through the store is a more significant step into the future than any piece of tech included in the system. The only consideration that really matters for a game system is its capacity to play games, and in that regard the PlayStation Vita is a resounding success. It offers the most power, the widest variety of input methods, and the most convenient method of getting new games, of any handheld system in history. The games are beautiful, and the system offers tons of flexibility in terms of how developers want them to be played, including the dual analog controls the PSP desperately needed. And the screen alone is a pretty convincing argument in favor of purchase. The fact that every Vita release will be available through the store is a more significant step into the future than any piece of tech included in the system. As always, this incredible Sony hardware is held back by Sony, either out of an effort to subvert pirates or just because of poor execution. The single PSN account limitation stings. The memory cards are outrageously priced, a complaint that carries far more water given that they're mandatory; managing data is functional, but can be tedious thanks to the proprietary interface. That's not to say the hardware itself is unimpeachable. The cameras are low-quality and oddly placed. The battery life is predictably lacking. I can't exactly list the rear touch pad as a fault, as it's just another one of many input methods, but it smacks of gimmickry. It isn't needed in a system with a gimmick as strong as "unbelievably beautiful games." This review is based on a Japanese 3G/Wi-Fi PlayStation Vita purchased by Joystiq in Japan, and a 3G/Wi-Fi PlayStation Vita provided to Joystiq by SCEA.